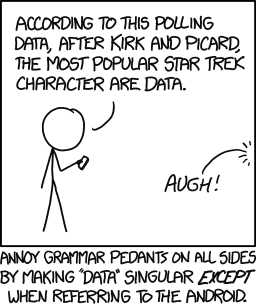 Grammatically, there's no actual indication that the speaker here is using Data-the-android as a plural noun. The subject is "the most popular Star Trek character." So he's really annoying grammar pedants by using "character" as a plural noun. Of course, since Munroe is a smart guy, perhaps he's getting meta, and the point was also to annoy those who analyze his linguistic analysis. Job well done.